Choose a theme word to live by for 2014 and tell us why you chose it. I've seen dozens of these posts over the last couple days. Women, bloggers, people I admire and strive to be like are choosing a theme word for 2014. I've seen "balance," - an excellent choice. I've seen "create." This appeals to me on so many levels. 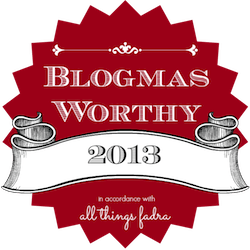 One blogger I follow chose "joy" as her 2014 theme word and really, what else is there to strive for in life? When I started thinking of a word that I wanted to use as my theme for 2014, I first started thinking of what I really want to accomplish this year. I don't really do resolutions and to be honest, I'm pretty content with most of my life. We are blessedly secure financially, emotionally and physically. I KNOW how blessed I really am. It seems selfish to want more. So is "selfish" a good word to choose? No. I couldn't deal with that. Although I have very selfish feelings when it comes to my time and my energy, I do try to make sure my actions don't reflect that. I want to be a giving person. I try every day to teach my boys NOT to be selfish. But in less than two weeks, I'm going to be 40. I know, I know, 40 is the new 30, you're only as old as you feel, blah, blah, blah. But if I'm going to do all these things I want to do with my life, no matter how you look at it, the clock is ticking. I need to focus on me more. I need to make things happen for myself. "Self-centered" crossed my mind as a possible word. And it's close, but not quite right. My boys, my husband and my family will always come first. Always. And I'm totally ok with that. It's my own feelings of guilt and inadequacy that continue to hold me back from what I want most of the time. Nobody is going to stand over my grave and comment on how neatly I kept my house, or on how I always served at least six desserts (from scratch!) at gatherings. This is not what I want my legacy to be. Then I thought of the exact right word. It's hyphenated, but that still counts, right? I'm still working out the details on what this should look like exactly. I've never been very good at it. I think it means being able to say no sometimes so I feel like saying yes to things that matter. I think it means tamping down the guilt I feel every time I spend money on myself. I think it means sitting down with a cup of coffee and a good book some afternoons and saving the laundry for another day. I think it means carving out time for writing every single day, even if it means something else goes undone. I think it means asking for help more when I need it. I think it means going after things I want. I think it means that at the ripe old age of (almost) 40, I'm starting to get a clue that I need to take care of me so I will WANT to take care of others. I think it means that I'm going to make sure that I have an awesome 2014. That I'm responsible for my own happiness. That I'm the only one with the power to make my life the way I want it. I think it means I'm finally figuring this living business out. Do you have a theme word for 2014? This is a phenomenal word choice. I failed to practice self care from the end of 2012 through the first half of 2013 and it nearly did me in. I'm now a huge advocate for it!! My word is mindful, and I think there are a lot of self-care concepts woven into it. Best wishes on your year!